Appetite and satiety under baseline and mirtazapine. Hunger (A), satiety (B), appetite for sweets (C) and fatty and salty food (D and E) are shown using mean intraday visual analog scales (VAS, 0–100 mm). The mean of 3 consecutive baseline days (baseline) is subsequently followed by drug days (M1 = day after the first given dose of mirtazapine; M2 = day after the second given dose of mirtazapine; and so forth). 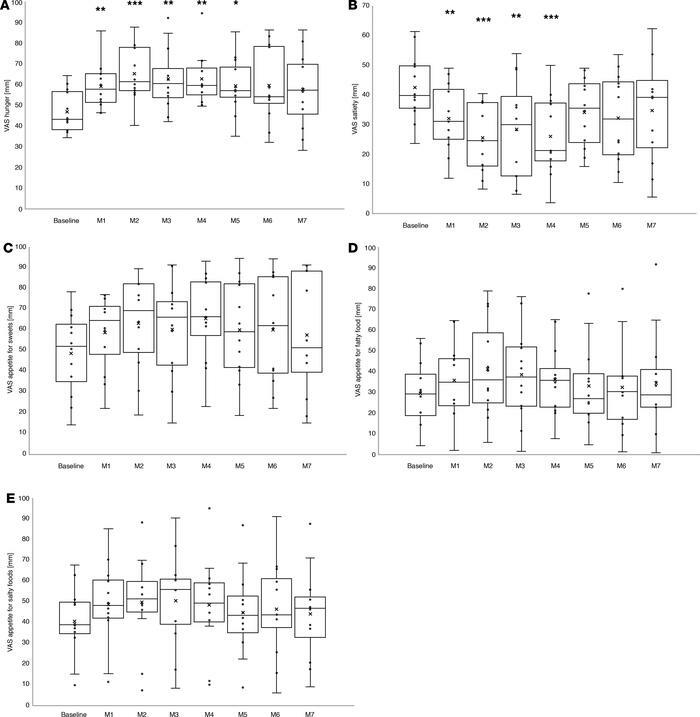 A repeated-measures ANOVA with a Greenhouse-Geisser correction indicated statistically significant day-to-day differences for hunger and satiety ratings (F[2.59, 23.30] = 5.27, P = 0.008 and F[2.57, 23.16] = 7.55, P = 0.002, respectively), with asterisks in A and B indicating significant differences compared with baseline ratings (post hoc Bonferroni corrected). *P < 0.05, **P < 0.01, ***P < 0.001. There was no statistically significant time effect for ratings of appetite for sweets and salty and fatty food in the repeated-measures ANOVA (P = 0.072, P = 0.067, P = 0.063, respectively). Individual values are indicated as circles. Lower and upper hinges of box plots represent first and third quartiles. Whisker lines correspond to highest and lowest values no further than 1.5 interquartile range from the hinges; outliers are beyond this line. Median lines are indicated across the boxes, and mean values are indicated with an ×.